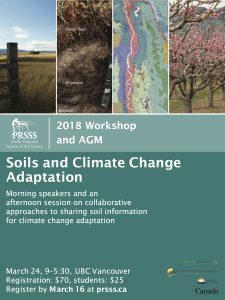 This 2018 workshop featured expert soil scientists from around the province discussing issues related to soil science and climate change adaptation. The PRSSS had its annual Poster Competition for the students during the Spring Workshop, with cash prizes (1st – $300, 2nd – $200 and 3rd – $100). REGISTRATION INCLUDED ADMISSION TO THE SPRING WORKSHOP AND AGM AS WELL AS YOUR MEMBERSHIP FEES FOR 2018/2019. The membership cycle for 2018/2019 is from April 1, 2018 to March 31, 2019.